Brisbane, Australia - One of the world’s great comedy impressionists! His mum wanted him to grow up to be somebody. He grew up to be..…everybody! 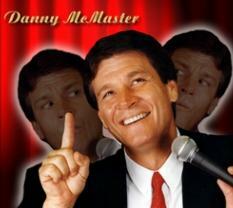 Super-Impressionist Danny McMaster has taken the entertainment scene by storm with his astonishing repertoire of more than 300, on-the-money characterizations of some of the world’s best-known celebrities. Audiences are mesmerized by Danny’s remarkable ability to replicate even the most subtle gesture and nuance in his exciting, non-stop performance, which has garnered nationwide critical review. McMaster is a one-man entertainment phenomenon. He is being hailed as one of the finest in the business today. Danny’s show is a marvelous journey filled with superb music, packed with laughter and seasoned with a hint of drama. Blessed with a magnificent singing voice, McMaster delivers anywhere between 50 and 70, dead-on impressions set to hilarious lyrics and routines, back-to-back without missing a beat. He keeps the audience in stitches with characterizations of stars such as Bill Cosby explaining cricket to the Americans; Dean Martin musing on drinking as an everyday health hazard; Dr. Phil pontificating that “there are rules men wish women knew”; politicians from around the world bunking down in the “Hotel California” and Sean Connery and Michael Caine wishing there were “A Few More Good Men”. Danny changes the show to suit the audience, so you never know who’ll pop in. You may see Billy Connolly, Sammy Davis Jnr., Jerry Lewis, Richie Benaud, Christopher Walken, Johnny Cash or Robert DeNiro. Bono may sing a song, too, and you may hear from Joe Cocker or Kermit The Frog. Don’t miss Danny McMaster’s extraordinary show. It will be an unforgettable evening of entertainment.